Nissiros is an extinct volcanic island close to Kos. Many tourist boats sail from Kos every day, then reach the volcano and island’s villages by bus. Rhodes the largest of the Dodecanese islands and the fourth largest in Greece lies in the southeast Aegean Sea, close to Asia Minor. Its mountains are mostly pine-covered with fertile valleys. Rhodes main products are wine and olive oil, ceramics, embroidery, textiles and carpets. Kalymnos is a small island famous for its natural sea sponges. It is mostly rocky with numerous caves along the shore. In the barren mountains are small fertile areas where citrus trees grow. Most of the population is involved in the fishing trade, tourism and as sponge-divers. Kalymnos lies between Kos and Leros. Patmos' main communities are Chora and Skala, the commercial port. Patmos is mentioned in the Bible (Book of Revelations). John the Apostle, the book’s author was on Patmos when he had a vision. Patmos is a destination for Christian pilgrimage. Visitors can see the cave where John is said to have received his Revelation (the Cave of the Apocalypse), and several monasteries on the island are dedicated to Saint John. In 1999, Chora, the Monastery of Saint John the Theologian and the Cave of the Apocalypse, were declared World Heritage Sites by UNESCO. 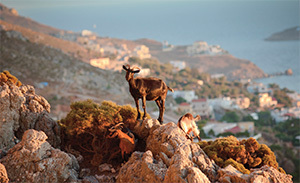 Leros is mountainous (rising to 327 m) and consists of three peninsulas joined by two isthmuses. Bathing beaches are found on the east and west coasts. It is believed that Leros and Kalymnos comprise the Kalydrian isles referred to by Homer. Most of the property on the island belongs to women due to a custom of handing down estates to daughters.